**Please read details regarding shipping and availability below. We sell what is commonly referred to as Red Wiggler earthworms but also go by the names of Red Worms, Composting Worms, Little Reds etc). The scientific name for them is Eisenia fetida. We do not sell worms by the count but rather by the pound. As a rule of thumb, a pound of bedrun (a mix of all the worms that come out in the first sorting) worms is around 1,000 worms but is more often between 1,200 to 1,400. If you are going to be using these worms for vermicomposting, then this is to your advantage as you will have both large and young worms to populate your beds. We only ship during the cooler months of the year that is roughly Sept 1 to April 30. The reason for shipping schedule is to help reduce the number of deaths in the transportation process. We do not guarantee the worms while they are in transit by any carrier (they all have problems, each one of them) and the carriers will not insure them. 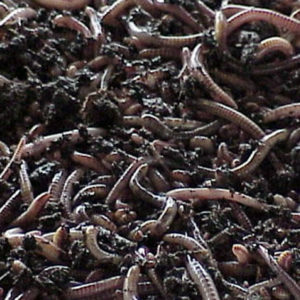 Also, we ONLY ship out on Monday and Tuesday of each week to help ensure that the worms are delivered by Friday or Saturday at the latest. So if you place an order anytime after Tuesday morning, your order will ship out the following week. This is not because we are slack, just because we want your worms to get to you ALIVE. We have found over the past 20 years that using Priority Mail by the USPS is actually the best method for getting your worms to you in the best condition. This is our preferred method of shipping and this will be how your worms are shipped to you. We always encourage customers to come to the farm to pick up worms (and castings as well) if they would like to. This is most commonly done on larger orders where the chance for shipping problems increases. We have the capacity to provide thousands of pounds of worms at a time. Please contact us directly if you are interested in larger quantities as we will work with you to arrange this at a reduced price since we are not shipping them to you.